Really, when I let a week go by without doing any laundry and I find myself taking every opportunity to hide under the covers rather than face the crisis in my laundry room - you know it has become overwhelming. I mean - SERIOUSLY overwhelming. I finally dragged myself to the mountain and asked Matthew to please help. Poor, sweet Matthew. He had to bend over and pick up the dirty underwear. You'd think they were creepy crawlers or something. I told him we all came from the same poop meister (well sorta) and he laughed, then he said that Dad's underwear was as big as Manhattan and it scared him. Poor guy. He had to pick up Sarah's bras and he didn't even flinch (I've got him trained good). By the way, this picture is not my dirty laundry. I don't dare photograph my dirty pile (if you can call it that with a straight face) for fear that the health inspector will show up at my door. This is someone else's dirty laundry. 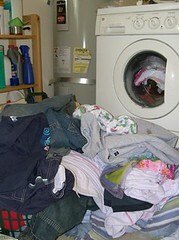 Why on earth would someone photograph their pile of dirty laundry? I don't know but I ain't startin' now. You can use your imagination as to whether mine is worse or not. Matthew: "Hey Mom, if I keep diggin, I might find Adolf buried under here." Me: "Heck, if you keep diggin, you may just find something living that doesn't live here." Matthew: "Yuk, I can't believe Dad's underwear, their as big as Manhattan." Me: "Yeah, but yours need more scrubbin' on the washboard"
Matthew: "Aw, Mom, they're not that bad"
Me: "Don't bet on it. Your bottom may be little, but it's the Prince of poop meister and skid marks." Matthew: "Ewww, that's just disgusting." Matthew: "I was wondering why you were lying down so much this week, and now I know"
Me: "You'd think someone in this family would help me with the laundry"
Matthew: "Hey! I'm helpin'! "Why did the toilet paper roll South?" Matthew: "To get to the bottom." Me: "I think this family needs a maid, what do you think." Matthew: "Among other things. (as he picks up something else from the floor) What's this?" Me: "I don't know. Just be thankful that the underwear is the next load in the washing machine or we'd be bare bottom by tomorrow."